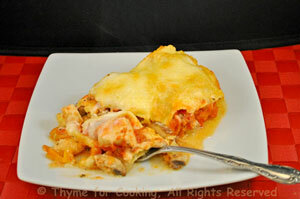 Butternut Squash and Chicken Lasagne, Thyme for Cooking easy one dish dinner. There are three interesting and different layers in this lasagne... and lots of vegetables!. I added a bit of yogurt to the Béchamel as a counterpoint the sweetness of the squash. Tomato Sauce: Cut chicken into small pieces, 1/3" (1cm) or less. Heat 1 tsp oil in medium skillet. Add chicken and sauté until cooked through. Add tomatoes, all juices, oregano, basil, cover and simmer 10 minutes or until needed. Vegetables: Trim and chop mushrooms. Cut butternut squash into small pieces, 1/4" (.75cm). Trim leeks. Slice in half the long way and rinse well. Thinly slice, up to and including some of the pale green. Heat 1 tsp oil in nonstick skillet. Add mushrooms, leeks, garlic, paprika and sauté until tender. Add remaining 1 tsp oil and butternut squash. Sauté until tender, about 10 minutes. Remove from heat. The Béchamel: In a medium saucepan heat the butter over low heat. Uncover, sprinkle with shredded cheese and bake 5 minutes longer to brown.